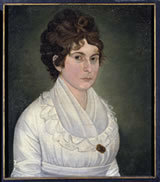 Elizabeth, daughter of Charles and Elizabeth Phelps, was born in Hadley on February 4, 1779. She grew up on her parents very large farm at "Forty Acres" and was well educated, though probably informally. In the 1790s, she travelled several times to Boston and Newburyport to visit with her brother Charles, sometimes staying for months at a time. Elizabeth met Dan Huntington in 1799, when he was guest preacher in Hadley and drank tea at the Phelps' home. Two years later, on New Years' Day 1801, they were married at "Forty Acres." The young couple went to Dan's home in Litchfield, Connecticut, where he was minister of the Congregational church. Later in the year, Elizabeth suffered from scarlet fever. In 1802, their first son was born, beginning their family, which was to grow to 11 children within 17 years. In 1809, the family moved to Middletown and Dan took over the ministry there. A minister's salary was just not enough to support this large family, so after Elizabeth's father's death, the Huntingtons decided to move to her family farm in Hadley. In 1816, Dan gave up the ministry and they returned to "Forty Acres." Over the next few years, Elizabeth Huntington went through a change in her views of the Trinity and in the 1820s, she was excommunicated from the Hadley Congregational church. After this, she and some of her children attended the Unitarian church in Northampton, but this could not replace the social life she lost by being barred from Hadley Church activities. On April 6, 1847, Elizabeth died in Hadley, having spent all but 15 years of her life at "Forty Acres."